Work to implement an agreement between Turkey and the United States over the Syrian town of Manbij has recently accelerated, Turkey's Foreign Minister Mevlüt Çavuşoğlu said Wednesday, adding that Kurdish YPG militia remained inside the town. "The process in Manbij has sped up despite the weather conditions but the road map should have been completed by now and the reason it hasn't been is the United States," Çavuşoğlu told a press conference in Washington. Çavuşoğlu said apart from the joint patrols in the city, Turkey has begun working with the U.S. on identifying who will run Manbij and who could be within the security units of the town once the PKK-linked People's Protection Units (YPG) terrorists have withdrawn from the area. After months of disagreement, Ankara and Washington agreed in June on a road map that would see the YPG removed from the town. Turkey has repeatedly expressed its frustration that the implementation of the plan has been delayed. "The U.S. administration also wants the road map to be implemented as soon as possible," Çavuşoğlu said. President Recep Tayyip Erdoğan said Tuesday that Turkey would only wait a few weeks for militants to be removed from the north Syrian town of Manbij. The U.S.-backed Syrian Democratic Forces (SDF), which is spearheaded by the YPG terrorists, has controlled Manbij since 2016. Çavuşoğlu was in the U.S. capital to attend a gathering of 79 countries partnering with the U.S. against Daesh. He said there was still little clarity on the details of a U.S. withdrawal from Syria and the creation of a safe zone in the northeastern part of the country. "No concrete ideas on the safe zone has emerged yet. We are discussing this with Russians as well and trying to coordinate it with the Americans," he said. In December, Trump confounded his own national security team with a surprise decision to withdraw all 2,000 U.S. troops from Syria, declaring that Daesh had been defeated there. Turkey wants to set up the safe zone with logistical support from allies and says it should be cleared of the U.S.-backed YPG terrorists. Çavuşoğlu repeated the safe zone could not be an area that would give protection to the group. "It is important what we understand from a safe zone. If what is understood or desired is a buffer zone that will protect the terrorists, we are against it," he said. 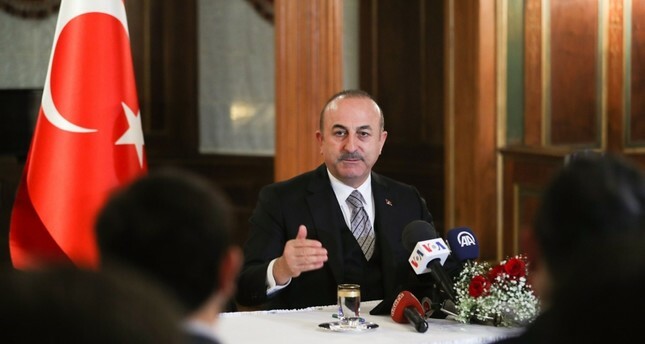 Çavuşoğlu also said a 'task force' group was set up between the U.S. and Turkey specifically to focus on the work linked to U.S. withdrawal from Syria. "We have put in place this mechanism to ensure this process is carried out in coordination and without problems," he said.